Mercedes's new r&d center in California will compete for top high-tech talent with nearby Google and Apple. The U.S. west coast is known for its sun and the surf, but to European premium automakers the big appeal is that it's home to some of the brightest technology developers in the world. 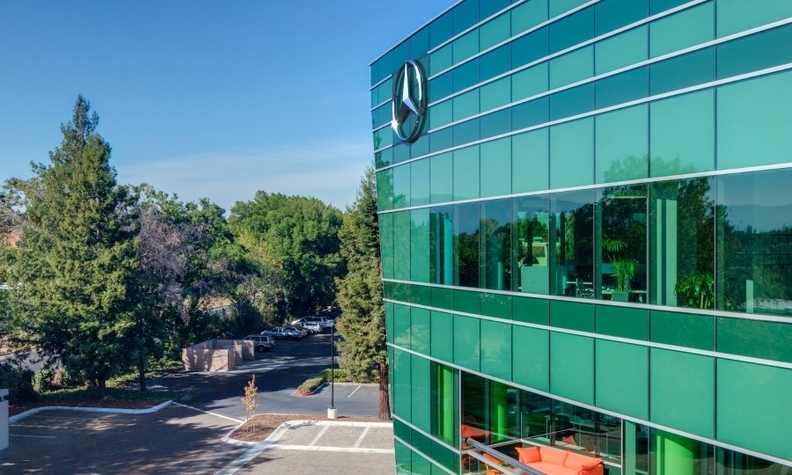 In November, Mercedes-Benz opened a new r&d center in the heart of northern California's Silicon Valley. In the same month, Jaguar Land Rover announced it would open a technology center in Portland, Oregon, which is often referred to as the Silicon Forest. BMW and Audi parent Volkswagen Group also have tech centers along the so-called U.S. "left" coast. "What are we doing here? It's quite simple. We're looking for future premium entertainment and telematics solutions," Daimler head of group research and sustainability Herbert Kohler told journalists at the opening of Mercedes' newest innovation center. The dashboard and the content it delivers has become a new battleground for premium automakers. That's why it's vital that they are located close to companies such as Apple and Google, said IHS Automotive senior analyst for infotainment and telematics Jack Bergquist. "Customers are increasingly expecting smartphone features and interface styles in their vehicle. It's gone beyond 'nice to have' and has become a key differentiator," he said. "This is one of the big reasons automakers want to be in Silicon Valley. They want to be close to the innovative businesses that can offer cross pollination." The new Mercedes building in Sunnyvale is less than 16km from the headquarters of Google, Apple and Facebook. It is also Mercedes' global center for apps development, the company said. In addition, the Mercedes technicians work on Internet connectivity and everything to do with how the driver interacts with the dashboard. "We haven't found anywhere like this," Kohler said of the location. "A lot of creativity comes out from here." The desire to tap into that creativity extends to the building's open-plan interior, which was designed by the same architects who styled the workspace for companies such as Amazon and Google. The result maximizes informal communication channels, said Paolo Malabuyo, head of advanced user experience design at the center. "It's not about the free coffee, it's about going out and talking to people on the way, 'Oh you're working on that? '," he said. The car companies realize that location is vital if you want to attract people like Malabuyo, who previously worked at Microsoft and innovative online game maker Zynga. "You can't attract talents to any other place. You really have to be in the area where this kind of technology is created," Jaguar Land Rover CEO Ralf Speth told Automotive News Europe. The location of the British firm's forthcoming tech center in the Pacific Northwest is home to a cluster of high-tech companies, including Intel. The semiconductor chipmaker is already collaborating with JLR on an infotainment platform based on the car-focused Genivi operating system and the new center will help speed this up, Speth said. "We want to be at the forefront of connectivity," he added. Speed is an important driver for the car companies. A new-car's infotainment system could be up to a decade old before the vehicle goes out of production, Bergquist said. But over-the-air downloads for apps and even more fundamental things such as adding new functions offer the promise of instant upgrades, and that's encouraging car companies to work closer with innovative west coast start-up firms. "Doing it in-house would cost you speed," Kohler said. "We try to team up as much as possible with the start-up companies that are here in order to be quick to market."